Want to backup your Blu-ray discs in a digital format to save physical storage space? Want to watch Blu-ray movies on a big screen-Samsung 4K TV via USB port? Here is a guide for you to make a digital copy of Blu-ray discs to a USB Flash Drive for watching on Samsung 4K TV. 1. Many people may use an external Blu-ray player to play Blu-ray movies on Samsung 4K TV, while you will pay much money on it and it may scratch your Blu-ray discs. So enjoy Blu-ray movies on your Samsung 4K TV from USB flash drive is a good choice. But you have to rip Blu-ray to Samsung TV supported video format before storing onto a USB flash drive. 2. Besides, the video resolution of common Blu-ray movies are usually 1080P, so to enjoy the best video playback on your Samsung 4K TV, you should adjust resolution from 1080P to 4K. It sounds difficult, but as long as you have a Blu-ray to TV ripper, it would become a piece of cake. Here, I suggest you to use Pavtube BDMagic. It is powerful enough to rip all kinds of Blu-ray discs with copy protections to Samsung 4K TV optimized video format. Besides, you are allowed to adjust the Blu-ray movies from 1920*1080 to 3840 x 2160 for your Samsung 4K TV playback. Moreover, if there are several language subtitles in your Blu-ray movies, you can select the language subtitle you want to show in your movies. Furthermore, it can create 3D video from 2D Blu-ray movie for playing on 3D TV with 3D effect. Mac user can turn to Pavtube BDMagic for Mac for downloading the right program. The program has updated to support the newest Mac OS X El Capitan. 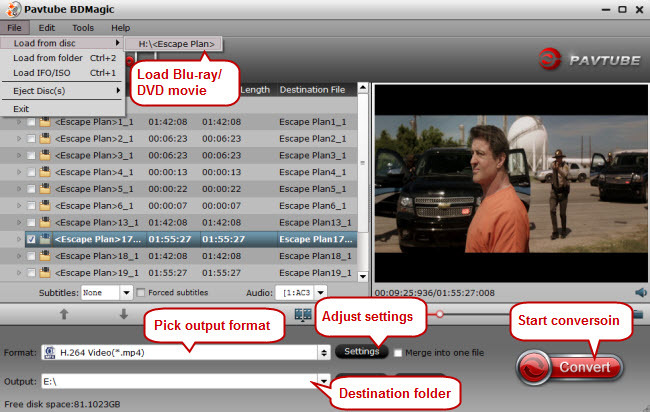 Insert your Blu-ray disc into an external Blu-ray drive, run the program on your computer, on the main interface click “File” > “Load from disc” to import the Blu-ray disc to the program. 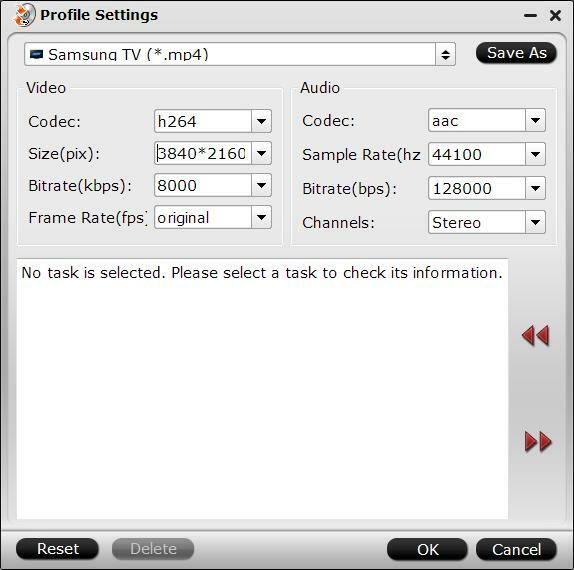 The app offers optimized TV supported profile for your Samsung TV. 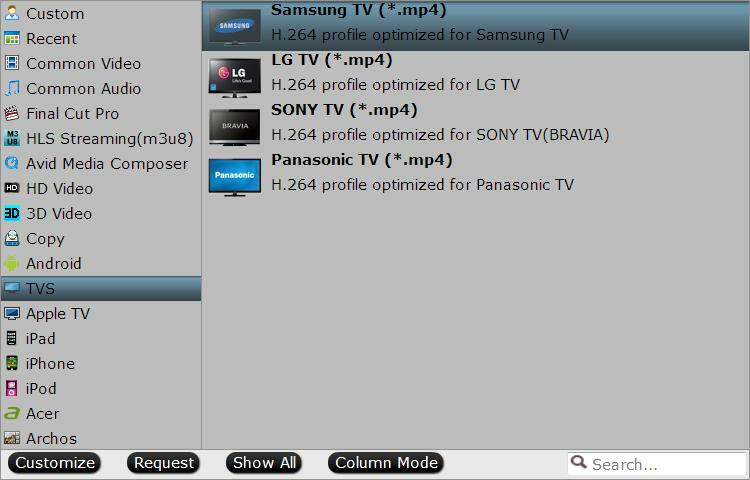 Click “Format” drop-down bar, scroll down to select “TVS” > “Samsung TV (*.MP4)” as the best output file format. Step 3: Adjust video/audio settings for Samsung 4K TV. Click the “Settings” icon and you will go into a new interface named “Profile Settings”. You can adjust video size to 3840 x 2160 to get the best video playback on your Samsung 4K TV. Note: If your 4K TV support H.265 codec, you can also set “codec” from H.264 to H.265. Switch back to the main interface, click the big button “Convert” on bottom-right corner to start conversion. When the process is over, you can find the converted files by clicking the “Open output folder” on the main interface of the program. Now, just transfer the converted Blu-ray movies to a USB flash Drive, then you can watch Blu-ray movies on Samsung 4K TV from USB Flash Drive via USB port. Does Samsung Smart TV support FLV video file? Solved!